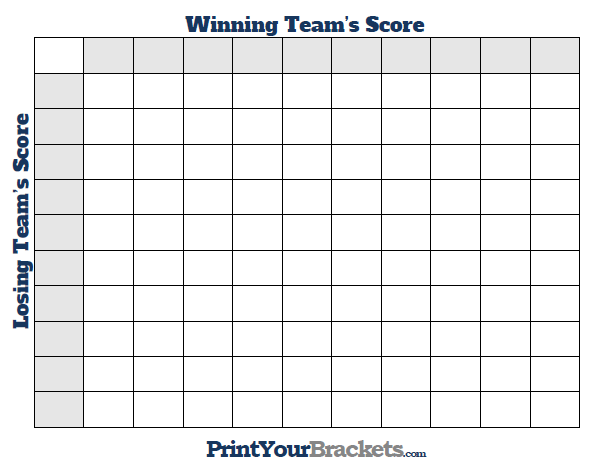 The grid below is to be used for a unique office pool that uses the last digits from the final score of every game throughout the entire March Madness tournament. There are a total of 63 games in the tournament, 67 if you count the play-in games. Each game has a winning square! At the bottom of this page, we go into further directions on running this pool. We have taken this pool even further with our March Madness Block Pool, which redraws numbers for all 6 rounds of the tournament. If you're looking for a grid for just a single game you can use our normal 100 Square Grid. Try Our Scratch-Off March Madness Squares! What there's another March Madness Pool? Most people think that the March Madness Bracket is the only office pool you can run during the tournament. We like to think outside the box and come up with new creative pools to run, such as our March Madness Props Pool and the March Madness Square pool you see above. How does the March Madness Square Pool work? The concept is the same as the Super Bowl Squares, in that you will be using the last digits of the two team's scores to find the person's name in the intersecting square. The difference being you will only be using the final score of the game, and every game in the tournament will have a winning square. If you want to run a little more advanced pool, try our March Madness Block Pool where the numbers representing the team scores will change for each round. Print the square grid from above and take it around to family and friends having them write their name in the square or squares of their choice. In Round 1 Illinois beats Florida by a score of 93 to 86. On the top row you will be looking at the last digit of the winning team's score, which is 3, down the left hand column you will be looking at the last digit of the losing team's score which is 6. Find where these two numbers intersect on the grid and the person's name in that square wins. You will do this for every game of the tournament. Most pools will weight the winning prizes by round. There will either be a total of 63 or 67 winners, based on whether you choose to use the play-in games or not.